The Department of Agriculture and Fisheries (DAF) has amended the Biosecurity Regulation 2016 to include entry requirements for citrus canker carriers. This Biosecurity (Citrus Canker) Amendment Regulation 2019 replaces the Movement Control Order (MCO) Notice for citrus canker and carriers issued in December 2018. The Regulation came into force on the 15 March 2019 and will stay in effect unless revoked. The Regulation applies to all citrus canker carriers entering Queensland from a state or territory where citrus canker has been found. Citrus canker carriers include host plants, plant material (including fruit) within the family (Rutaceae) and associated planting media and soil, machinery or equipment. Carriers entering Queensland from states where citrus canker has been found must meet the requirements under the Regulation, including that they are either from a certified interstate free area or are certified as meeting risk minimisation requirements outlined in the Queensland biosecurity manual (PDF, 1.9MB). 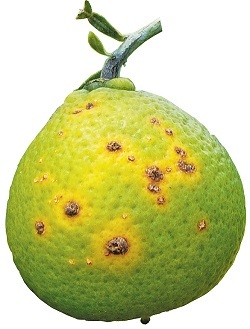 Citrus canker was detected in 2018 in the Northern Territory and Western Australia. This contagious bacterial disease affects all citrus plants. The disease can be spread rapidly over short distances by wind-blown rain, weather events and human movement, particularly in tropical and subtropical climates. Infected plants display lesions which form on leaves, fruits and stems, resulting in low plant vigour and a reduction in fruit quality and quantity. Citrus canker can also be spread between plants by machinery and any equipment used in the production of crops in the citrus family. If you suspect citrus canker on your property, report it immediately to the Exotic Pest Plant Hotline on 1800 084 881 or Biosecurity Queensland on 13 25 23.